The fact that any Christians would not recognize J. K. Rowling’s Harry Potter books (and the corresponding movies) as a ploy of the Devil to introduce witchcraft to millions of people, especially children, is a sad testimony to the dearth of biblical knowledge in the Church today. The fact that some go so far as to endorse the books as advancing good-versus-evil “Christian” principles is even more discouraging. For example, in John Granger’s article titled Harry Potter and the Inklings: The Christian Meaning of The Chamber of Secrets, he misses the boat by not seeing how Satan often tries to get people to choose between two alternatives, neither of which is true. In this case, the Devil promotes the whole modernistic, naturalistic, materialistic, no-spiritual-dimension belief system and then comes along with Rowling’s supposedly Christian antithesis to that. Granger says that “Rowling asks us to look at the world magically,” and he speaks of her “edifying use of magic in literature.” If God’s Word is true, both of those things are exposed as untrue. Granger uses no Scripture to document his assertions. We don’t need J. K. Rowling to lead an attack on modernism, etc., as we already have Jesus Christ and the Word of God, which has none of the harmful side effects that come with ingesting Harry Potter. Perhaps there are some Christian principles (e.g., good versus evil) woven into the H. P. narratives, but really, how many people, especially kids, do you think will come away with a Christian orientation or hunger and pursue that hunger by delving into the Bible? I’d say few, if any, for it doesn’t give them any real direction. And I think that even those who do notice anything akin to Christian ideology will be drawn in by that and then led astray by the more powerful message Rowling is promoting, which is that magic is anything but evil. If we allow God to speak for Himself, we can see things as they really are. First, what does He say about Satan, His arch-enemy? God makes it clear that the Devil is the Master Counterfeiter. The main characteristic about a counterfeit is that it looks a lot like the real thing. You or I would be fooled by an excellent counterfeit $20 bill. Why? Because we have not sufficiently studied the genuine article in minute detail, but the women I once saw at the U.S. Mint in D.C. could quickly go through bills and pull out the bogus ones—it was amazing. Of course they had been there 20 years. There is no such thing as the “good magic,” “good spirits,” “good force,” etc., that Rowling promotes in the H. P. series. That rhetoric is a trick of the Devil to entice people into his realm of the spiritual, but it wouldn’t work if people took even a quick look at The Book. For example, here are some things God says about what Harry Potter, many kids’ new hero, epitomizes. (9) When you enter the land the Lord your God is giving you, do not learn to imitate the detestable ways of the nations there. (11) or casts spells, or who is a medium or spiritist or who consults the dead. (12) Anyone who does these things is detestable to the Lord, and because of these detestable practices the Lord your God will drive out those nations before you. (13) You must be blameless before the Lord your God. (14) The nations you will dispossess listen to those who practice sorcery or divination. But as for you, the Lord your God has not permitted you to do so. (15) The Lord your God will raise up for you a prophet like me from among your own brothers. You must listen to him. I included that last verse because it is a major Old Testament prophecy about JESUS, who is the true “good force” who would come to destroy the works of the Devil, the bad force (1 John 3:8). (14) But they would not listen and were as stiff-necked as their fathers, who did not trust in the Lord their God. (15) They rejected his decrees and the covenant he had made with their fathers and the warnings he had given them. They followed worthless idols and themselves became worthless. They imitated the nations around them although the Lord had ordered them, “Do not do as they do,” and they did the things the Lord had forbidden them to do. (16) They forsook all the commands of the Lord their God and made for themselves two idols cast in the shape of calves, and an Asherah pole. They bowed down to all the starry hosts, and they worshiped Baal. (17) They sacrificed their sons and daughters in the fire. They practiced divination and sorcery and sold themselves to do evil in the eyes of the Lord, provoking him to anger. All those things come from the same source: Satan, and they are all tied together, in that one thing is designed to lead to another. If the king of Babylon is into those things, we should avoid them. (11) They followed him because he had amazed [KJV=bewitched. Greek=to put one out of his mind] them for a long time with his magic. (12) But when they believed Philip as he preached the good news of the kingdom of God and the name of Jesus Christ, they were baptized, both men and women. (16) Once when we were going to the place of prayer, we were met by a slave girl who had a spirit by which she predicted the future. She earned a great deal of money for her owners by fortune-telling. (18) She kept this up for many days. Finally Paul became so troubled that he turned around and said to the spirit, “In the name of Jesus Christ I command you to come out of her!” At that moment the spirit left her. The above verses show that evil spirits are behind all such occult practices. It seems like God wants to make it crystal clear that having anything to do with such “curious arts” is like playing with fire. Consider this extremely interesting and enlightening testimony, from which I learned a lot. (1) “Harry is an absolute godsend to our cause,” said High Priest “Egan” of the First Church of Satan in Salem, MA. “An organization like ours thrives on new blood – no pun intended – and we’ve had more applicants than we can handle lately.” Harry Potter? What Does God Have To Say? I am writing this urgent message because I was once a witch. I lived by the stars as an astrologer and numerologist casting horoscopes and spells. I lived in the mysterious and shadowy realm of the occult. By means of spells and magic, I was able to invoke the powers of the “controlling unknown” and fly upon the night winds transcending the astral plane. Halloween was my favorite time of the year and I was intrigued and absorbed in the realm of Wiccan witchcraft. All of this was happening in the decade of the 1960’s when witchcraft was just starting to come out of the broom closet. It was during that decade of the 1960’s, in the year 1966, that a woman named J. K. Rowling was born. This is the woman who has captivated the world in this year of 2000 with four books known as the “Harry Potter Series.” These books are orientation and instructional manuals of witchcraft woven into the format of entertainment. These four books by J. K. Rowling teach witchcraft! I know this because I was once very much a part of that world. Witchcraft was very different in the 1960’s. There were a lot fewer witches, and the craft was far more secretive. At the end of that spiritually troubled decade, I was miraculously saved by the power of Jesus Christ and His saving blood. I was also delivered from every evil spirit that lived in me and was set free. However, as I began to attend fundamental Christian churches, I realized that even there witchcraft had left its mark. Pagan holidays and sabats were celebrated as “Christian holidays.” As time went on, I watched the so-called “Christian” churches compromising and unifying. I also watched with amazement as teachings from Eastern religions and “New Age” doctrine began to captivate congregations. It was a satanic set-up, and I saw it coming. Illuministic conspirators were bringing forth a one-world religion with a cleverly concealed element of occultism interwoven in its teachings. In order to succeed in bringing witchcraft to the world and thus complete satanic control, an entire generation would have to be induced and taught to think like witches, talk like witches, dress like witches, and act like witches. The occult songs of the 1960’s launched the Luciferian [“Lucifer” means “light-bearer”] project of capturing the minds of an entire generation. In the song “Sound Of Silence” by Paul Simon and Art Garfunkel, we were told of seeds that were left while an entire generation was sleeping, and that the “vision that was planted in my brain still remains.” Now it is the year 2000. All of the foundations for occultism and witchcraft are in place. The Illuminists have to move quickly, because time is running out. It was the Communist revolutionary Lenin who said, “Give me one generation of youth, and I will transform the entire world.” Now an entire generation of youth has been given to a woman named J. K. Rowling and her four books on witchcraft, known as the Harry Potter Series. Does all this mean that everyone who reads H. P. will become seduced into practicing witchcraft? No. But the books build a desire to practice spiritual magic (witchcraft). For some, that will remain a fantasy. Others, however, will begin to practice by casting spells, and their desire to live out this fantasy will lead them into a belief system that promotes, either indirectly or directly, the worship of Satan. Such indirect worship via actionable spells and other spiritual manifestations will likely lead to misery and destruction like that of the direct worshiper of the Devil. 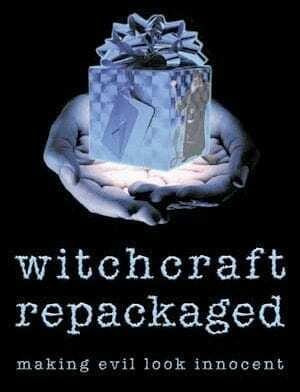 The evil spirits behind witchcraft are the counterfeit to the God of Abraham, the Father of Jesus, and His angels, and are in the H. P. books/movies being introduced to a generation that is embracing them as good spirits whose power is to be coveted. These children have a genuine desire to power up and be like Harry and Hermonie and defeat evil and do good. Many will rise to positions of great power and become accomplished Wizards in the coming years. Most will rely on that power to help them in time of need instead of praying to the true God, and when they do, they will find emptiness when they most need help. The spiritual seduction of witchcraft will not lead to genuine good in a practitioner’s life, as that is against the Devil’s nature, which is to steal, kill, and destroy. Direct or indirect orientation to, and/or worship of, the Devil by practicing spells and witchcraft, whether via white or dark magic, will lead only to harmful outcomes. The Word of God is the most exciting, meaningful, applicable, and well-written literature on the planet. I pray that you will read that to your kids rather than the deceptive fantasy of H. P. Unlike the fabrications in H. P., records like Elijah and the prophets of Baal, the parting of the Red Sea, et al, really happened, and they illustrate the goodness and the power of God as He opposes and overcomes the evil of Satan.